Known by several names, the Gold Rush was a vital contributor to the Gilded Age, as Mark Twain called the years between 1878 - -1899. The Gilded Age was the era of great fortune and wealth. It brought industrialization, the gold rush, vast railroad development to include rails to Alaska, and more. In 1899 construction on the White Pass & Yukon Railroad that began a year earlier (May 1898) was completed. But with the hope for wealth, for many, there was also great loss. As seen on TLC: Who Do You Think You Are? Episode 2 of Season 5 with Jesse Tyler Ferguson, mining companies, investors, and prospectors headed toward Alaska, but many failed to reach their destination due to harsh climate, avalanches, and illnesses. Over 100,000 were led to join the fray of the Stampeders to Alaska but only about 30,000 completed the trip. The climate, however, was not the only contributor to the high mortality rate. Thousands were killed laying transcontinental tracks, and the unregulated industrial efforts across America proved deadly for many. Families were torn and forsaken, all the while political and racial tensions rose. That was the Gilded Age. If your ancestor chose to make his fortune in Alaska during the Gilded Age, family historians will find the research arduous, but not impossible. With the diverse trails and routes to Alaska most travelers found themselves hiking and riding horses by land and taking boats and steamers up the river. But whether by boat/steamer, horseback or on foot, the same fate was common. Researchers should be familiar with both the land trail and steamwheelers and riverboats courses to Alaska. With a bit of sleuthing the researcher may uncover the listing or history of vessels, names of boat captains or a passenger lists. In the diary that Jesse Tyler Ferguson reads on Who Do You Think You Are?, the July 1898 Monte Cristo River Steamer is referenced. This Steamer operated from 1898-1903. A helpful reference when tracing steamboats can be found in the Annual Report of the Supervising Inspector General of Steam-Vessels- Inspection for the relevant year. 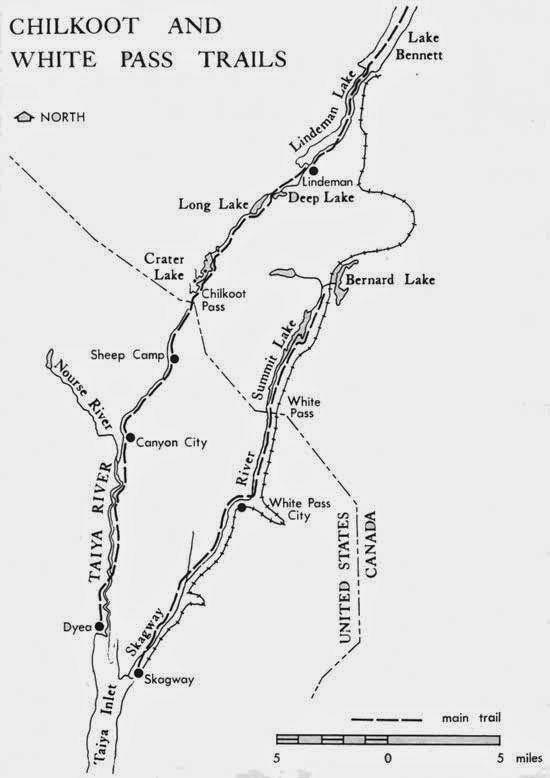 Through this report we learn that the Monte Cristo was used to traverse the Stikine River. National Parks Service (NPS). The NPS website is a great place to learn of the Alaskan trails, popular routes and events that may assist your ancestral research. The site boasts an expansive list of “searchable databases of people who went north to Alaska (and Canada during the gold rush.” They include the 80,000 genealogical records held at the Dawson City Museum, images of the gold rush at the Valdez Museum and Historical Archives and a Historical Database. Alaska State Library. 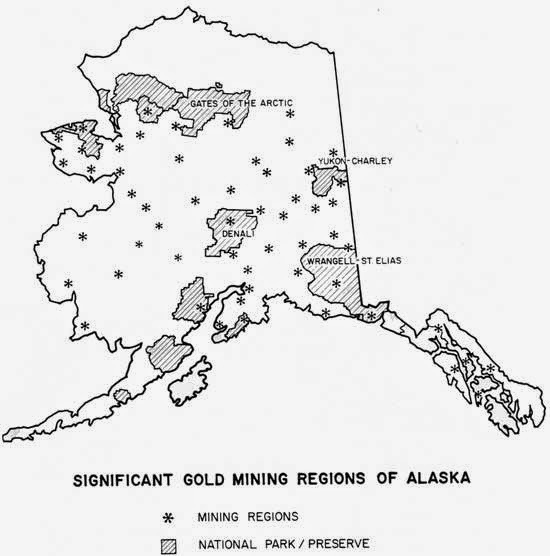 The Alaska State Library offers Finding Your Gold Rush Relative to provide research sources for “the Klondike and Alaska gold rushes,” 1896-1914. Find A Grave. Landslides, avalanches, and other natural disasters often explain the cemeteries along the trials. Find A Grave has listed 116 burials in Slide Cemetery in Skagway Borough, Alaska. 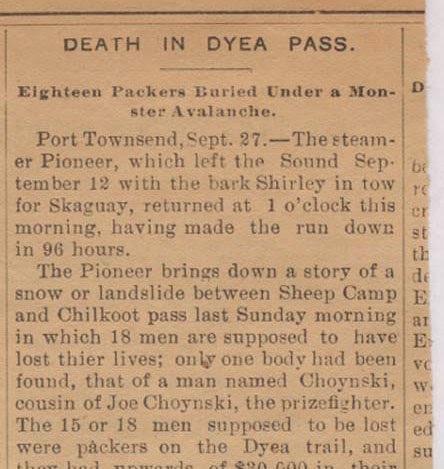 A Palm Sunday avalanche killed between 60-100 travelers over the Chilkoot Pass and the bodies recovered from this 3 April 1898 event are interred in Slide Cemetery. The listing of the Palm Sunday Avalanche victims may also be seen at the National Park Service website. Nationwide Newspapers. Across America newspapers were reporting the trials, tribulations and successes of the Stampeders - Gold Rushers. 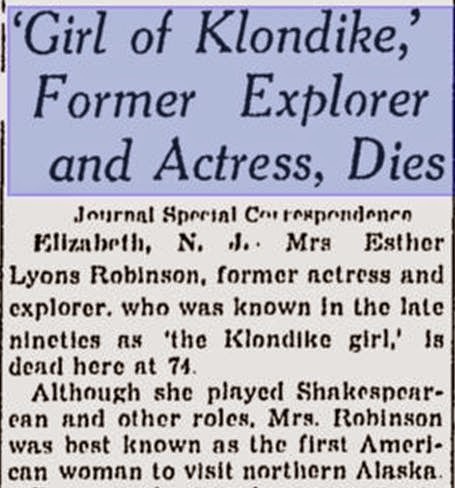 Either way, local news often reported names and dates of departure and news of the travelers if it reached the homefront. Diaries of Women and Men. The Klondike women’s population was about eight percent (8%) - mostly housewives, a few wealthy investors, but few worked as miners. Accounts of their travels might be found in diaries. Visit the Alaska State Library for diares of Mary Jane and Fred Healy, 1884 - 1891; Clare M. Stroud Boyntan Phillips, 1898-1902; Elizabeth Robins, 1900, and more. Read about the adventures and accounts from Jack London, Sam Dunham, Robert Service and more: Gold Rush Literature, National Park Service. Like other adventurers, black gold miners settled in Alaska as did African American seamen and miners. For more information review Black Heritage Sites by Nancy C. Curtis, Ph.D. In addition, researchers may find their African American soldiers from the 24th Infantry - Buffalo Soldiers – in the Territory as they were dispatched May 1899 for the purpose of maintaining peace and order. Although respected as fierce soldiers, they faced racial prejudice in the Territory. 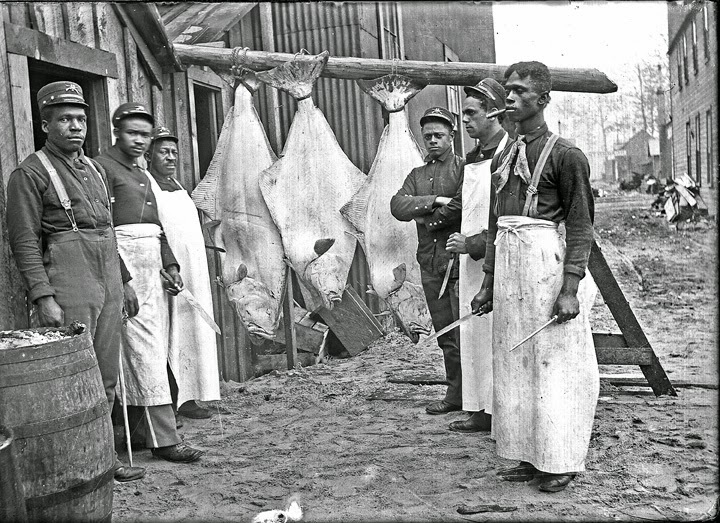 And, according to the enumeration of the 1900 US Census, only 168 “black people” were recorded living in Alaska after the gold rush.